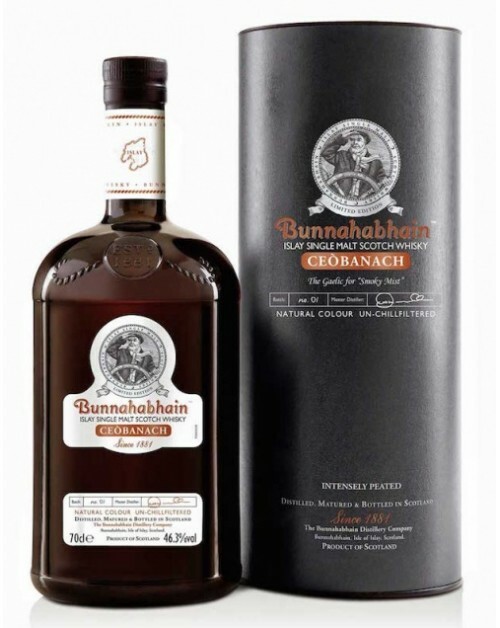 The distillers of Bunnahabhain Ceobanach Single Malt Whisky have harked back to the era when the distillery used to produced heavily peated whiskies. The name Ceobanach means smoky mist in the Scots' Gaelic tongue. This whisky is rich with a signature smokiness that traditional Islay whisky fans will relate to. Ceobanach was matured in ex bourbon casks and bottled without the chill filtration process. Nose: Peat notes from the outset, followed by lemon zest, vanilla and crumbly cookies. Palate: Sea spray prevails then spices, lemon zest and a crack of pepper. Finish: Long with a smokey finish.